"Like the No.9, it's a very complex, balanced blend but spicier with more pepper and less earth. It sports an amazing stalk cut, river valley grown Habano capa grown exclusive for us. We have been fermenting this leaf since September 2006. Not aging, fermenting! It has been a ball breaker, but the result has made it worth it, imo." So far I haven't found too many retailers selling this cigar but the one I did find lists the tobacco in the cigar as a filler blend of Dominican, Nicaraguan and Honduran tobaccos, with a Brazilian Mata Fina binder and a proprietary stalk cut Habano wrapper. The price listed for a box of 24 is $242.99. The cigars I sampled were pre-released with hand-written cigar bands. If the final product is anything like the ones I've smoked then no one should be disappointed. The cigar is beautifully made with a neat symmetrical cap, tight seams, and not an obtrusive vein in sight. The cigar had wonderful oils and feels smooth to the touch. The color was a dark mahogany with dark blemishes all over. The scent was an unusual perfume-like fragrance with rich leathery overtones. The cigar has definite heft to it. It feels evenly packed with a slight give. I clipped the cap with a Xikar cutter and found the draw to be perfect. It was clear with a slight pull of resistance. The pre-light flavor was definitely peppery, causing a tingle to my lips and tongue. After lighting the cigar, I was able to confirm that the draw was outstanding. Billows of smoke come through to coat your entire mouth. The cigar is full of rich flavor and spice. Notes of dark coffee followed by toasty wood with a heavy dose of black pepper on the finish. The spiciness is off set slightly by a nice creamy sweetness. The first inch was a little rough, as the cigar showed a tart cedary note and the dash of pepper a little too heavy. But stay patient because once the cigar settles down you get a very pleasant smooth and balanced blend of cedar, sweet raisins and pepper. At times I tasted a mild roasted nut flavor as well. Eventually a dark coffee flavor returns and progresses to a full rich leathery body. The pepper never goes away, which really was not a bad thing, as I feel it added interest to the entire smoke. Another thing that impressed me about the Liga Privada T52 toro is the fact that it was full flavored without being a nicotine bomb. I bought some Padron Anniversary Exclusivos recently and I swear the roller must have went crazy with the ligero because it was way too strong for my taste. The T52's on the other hand, contained just the right amount of ligero for ideal strength without knocking you down. In the last third, my cigar developed some large holes in the filler which caused the draw to really loosen up and the tobacco to burn a little hot. Care had to be taken to smoke a little slower at this point. The smoke volume was still thick and the flavor became mostly dark coffee, leather, black pepper and a touch of sweetness. Once the flavors got syrupy, I put the cigar down. This left about an inch an a half of the cigar remaining. 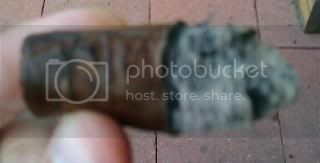 Overall, I was very pleased with the way the Liga Privada T52 toro smoked and tasted. The burn line stayed even with very little effort and the ash was nice and compact, holding on for well past the one inch point. The ash color was dirty gray and no beauty to behold, but if I had to choose between flavor or appearance, I would definitely choose the former. The Liga Privada T52 toro is delicious, and for the effort involved in fermenting the wrapper, I think it's worth the ten dollar plus price tag per cigar. The Cugine Robusto and Torpedo Maduro cigars are made by Arganese Cigars and Joseph (Joe) Gannascoli, the actor "Vito" from the cast of The Sopranos. Joe is also a chef, author, and now a fine tobacconist. Cugine roughly translated means cousin in Italian. These cigars have a striking double label which is antique-style silver on black. The front features an old-time photo of (I believe) Joe himself (not 100% sure yet). The first label on the top includes the words "Social Club" to the left and "Members Only" to the right. The bottom label has Joe's signature above Arganese Cigars, with the Arganese emblems to either side. The cigars are only available in two sizes at this time: the Robusto (5" by 50 ring gauge) and the Torpedo (6 and 7/8" by 50 ring gauge), with a sharply pointed head. Both cigars are made in the Dominican Republic and are firm and heavy with prime Dominican long filler, along with a Honduran Sumatra-seed binder. The cigars are available in a slightly sweet, medium-bodied smooth Ecuadorian-seed Connecticut wrapper or the also slightly sweet, spicier and more full-bodied Brazilian-seed Maduro wrapper. All the cigars have well made Cuban-style triple caps. These cigars are available as a limited release pre-box bundle for a very reasonable price of $3.00 per stick, or $59.99 for a bundle of 20 Robustos or $64.99 for a bundle of 20 Torpedos. I have only sampled the Maduro wrapped cigars for these reviews, which I usually prefer over a Connecticut wrapper. However, I am told the Connecticut is an even smoother smoke than the Maduro. As for the Maduro, it is a very dark cocoa-colored brown. The wrapper is very oily with only slight veins present. It has a faintly sweet, rich and very earthy dark chocolate aroma to it. I enjoyed the feel of handling these cigars prior to lighting up. The smell of this cigar makes you want to bite into it. But please do yourself a big favor and clip and light it instead. Each cigar has a nice hefty weight to it and is firm with no soft spots. I used both a punch cutter and a double guillotine-style cutter on the Robusto. Both work rather well, but I prefer the slightly wider than normal punch cut. The pre-light draw is always excellent and the flavor is as well for both the Robusto and Torpedo. Upon lighting with my triple torch lighter, the first aromas are of a dark cherry wood, not cedar or oak, with hints of nuts. It reminded me of the scents of walking through the loam on a forest floor...very earthy. There was no gummy taste from the excellently made triple cap. Instead, there was a hint of sweetness followed by a buttery smooth spice, along with rich, deep and bold flavors. This is not in any way the in-your-face boldness of some cigars, but rather it creeps up on you and says, "Well hello there friend!". While most people describe a taste of leather from a cigar, here I would have to say it's more tame than that, more like deerskin. Instead of an oak flavor, again I got more of a sweet cherry wood aroma and flavor. I did not get the tips of any veins or stems coming through the cut of the head, as you might with some of even the best cigars. Nor were there any pieces of binder getting in my mouth. Both of which are pet peeves of mine. The cigar started out smooth and rich, building as the cigar burned, but never got harsh or hot. It also had a pleasant slight metallic taste like that of being barrel-aged, with an ever so slight oak flavor, hints of pecan and a very well-tamed ligero. You can taste the aging and fermentation of the leaves. There is no distinct harsh bite to this cigar, but there was some enjoyable and immediate tingling on my lips and tongue throughout the smoke. The flavors increased in richness and complexity and boldness, but also got smoother as it went along. This is the perfect cigar to exhale (sometimes called re-haling) through your nose, as there is no harshness or irritation and it will not make you sneeze. The odor exhaled through your nose is exactly what you get in your mouth. Smooth as butter, rich and complex flavors not easy to come by in some cigars. This is the type of cigar you find yourself sitting and pondering with. Take your time with it. Savor it and don't rush it. Both cigars produced voluminous clouds of blue smoke. I believe these are the perfect cigars for a woman (or man) who love a richer, bolder smoke. They remained smooth from start to finish. Also, the burn line was perfectly even, with a wrapper that correctly burned by rolling under into the burn line, rather than spreading up on the wrapper. You can only get this type of burn with a perfect moisture level and a good quality wrapper. Both cigars burned with a somewhat mottled dirty gray ash, leaving distinct puff lines like that of tree rings rather than a perfect white ash. I did not find this off-putting because the taste and smell, along with the length of such a firm ash was mesmerizing. 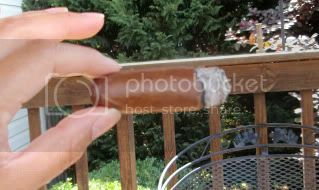 On the robusto, I had the ash only fall twice before I nubbed it down to just under an inch long before laying it down. 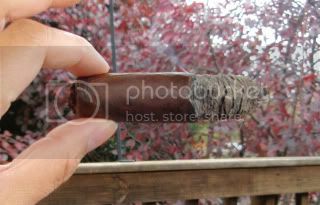 On the torpedo, the ash also stayed 2 1/2 to 3 inches long each time, and also burned down to less than an inch long nub. I can feel confident smoking this cigar even on a windy day knowing that the ash will not fall on me, my puppies or anyone else around. I only get to smoke indoors in my car or at my boyfriend's house. I find Cugine cigars to be the perfect cigar for conversation, playing hand-held Solitaire, or when watching the dogs and kids play. I will always have a few stashed in one of my humidors. This cigar has outdone anything else I have bought or been given to smoke. This lady smoker rates them a solid 90. I am tempted to rate them higher but I had to make an automatic deduction because it did have a few more veins showing than I would have liked. I pledge to always try to find great quality smokes on a budget for us less than snobbish cigar lovers, man or woman. That is this woman's take on these new release cigars. Be watching for the box release of these babies. I bet the price goes up then. This review is sponsored by Silo Cigars, home to rare cigars, aged cigars, and hard to find boutique cigars. The "R&R" in the Savinelli R&R Series Y stands for Rico y Raro, or Rich and Rare. I'm not sure how rare these cigars are but I would whole heartedly agree that it is a rich tasting cigar. This cigar was introduced in 2008 and consists of an Ecuadorian Habano wrapper, with a binder and filler from Nicaraguan grown Cuban seed long leaf tobacco. A total of four vitolas are available with no ring gauges smaller than 52. I smoked the double robusto which measures 54 ring gauge by 5.5 inches. The cigar has a strong barnyard aroma with predominate sweetness detected at the foot. The construction is neatly done and finished off with a triple cap. No large veins were detected on this smooth and evenly packed robusto. The initial flavors showed nice chocolatey notes and a vanilla-like creaminess, along with a peppery finish. I detected some definite Nicaraguan "zing" in this smoke. The tangy wood flavor developed into a more defined sweet cedary character after about the one inch point. The pepperiness also ramps up as you smoke it, but nothing overwhelming in my opinion. In fact, I found the cigar to be nicely balanced with it's caramel sweetness tempering the peppery note. The cedar body gives way to leather in the second half of the smoke. No bitterness was detected even though holes in the filler caused the cigar to smoke hot in the second half. The draw was nicely open and free. The burn line was thick and wavy with the resulting ash looking dark gray and flakey. I had to touch up the burn line several times but this may have been due to being outside in windy conditions. Overall, this was a nice rich flavored cigar that gave off a pleasant room note of quality aged tobacco with chocolatey notes. My mouth stayed moist which was a nice change of pace from toasty cigars which can leave your mouth dry like the Sahara desert. My only complaint is that the cigar was not available in smaller ring gauges, not even the traditional 50x5! Hopefully the manufacturers will reconsider and add smaller sizes to their line-up. The retail price of the double robusto is $7.45 a stick. Give Silo Cigars a call at 1-865-675-7456 for current prices and availability.